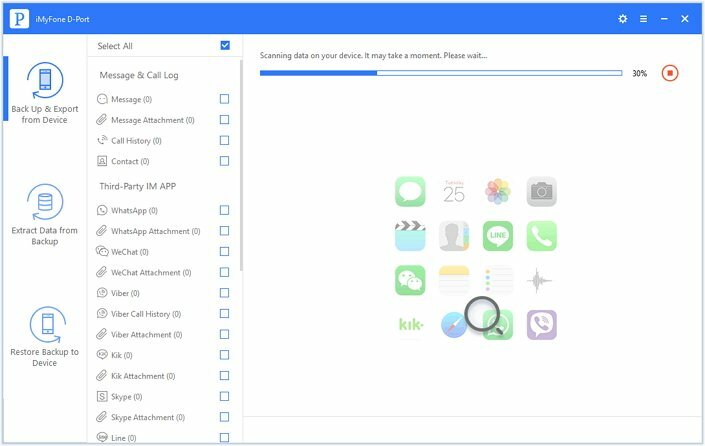 Are you facing a sudden shutdown problem with your iPhone? Do not worry! You are not alone, there is a high rise in the number of complaints where iPhone users are facing battery issues on their iPhones. It has been reported that the phones were abruptly shutting down although there is sufficient battery life remaining. In this article, we will explain Apple's solution and the things you need to know before or after you turn to Apple. Apple recently addressed this problem faced by its users where iPhone's been randomly shutting off even though there is 30% battery left, and when phones are plugged back in again, the battery indicator quickly jumps back to 30%. Apple has issued a statement to protect its users and addressed the issue saying that the problem is persisting only in specific iPhone 6s devices with specific serial numbers. In their report, Apple clarified to the users that a small number of iPhone 6s devices made in September 2015 and October 2015 consisted of a battery component that was exposed to controlled ambient air longer than usual before being assembled into battery packs. And this resulted in batteries degrade faster than their normal batteries and lead to unexpected shutdowns to occur. And Apple also insisted that there is no safety issue with this problem. To fix the problem, Apple allows you to check your iPhone's serial number on their website, and if it comes under the affected phones, you can approach your nearby Apple store and get this problem resolved as they will replace the phone's battery with the new battery. You found a solution to get your batteries replaced from an authorized Apple store but before heading to the Apple store make sure you get your iPhone data backup. You can backup your iPhone data in two ways either by iTunes/iCloud, or selectively back up your data with a third-party tool. Let's understand in detail how you can use two of these methods to backup your iPhone data. Here is how to back up your iPhone through iTunes. Step 1. Download or upgrade the latest version of iTunes on your computer and then open iTunes. Step 2. Now, Connect your iPhone to the computer system using the included USB cable that you received with your iPhone and find your connected iOS device on the window. Step 3. Once you find it, click it. When you go to the follwoing interface, click "Back Up Now". In this way, all the data on your iPhone will be synchronized to your computer through iTunes. 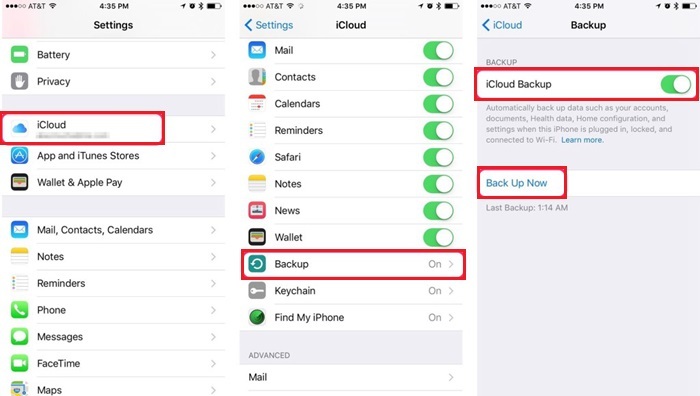 Step 1: Turn your iCloud Backup "ON" in Settings > iCloud > Backup and then turn Backup ON. 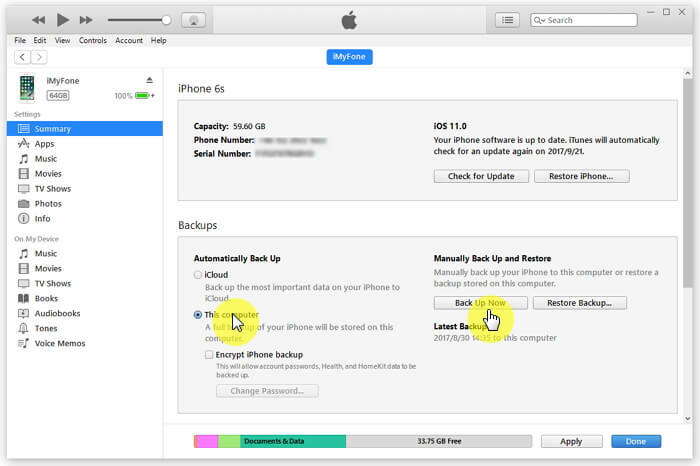 Step 2: When you turn the backup ON, you will see the option of "Back Up Now". Choose it and make sure you connect your device to a power source and a Wi-Fi network. Step 3: After that wait for the backup to be completed. Check that you have enough available space in iCloud for the backup and you are done. Apple offers 5GB iCloud storage for free, and you can buy more if you need. Sometimes we only want to back up some important data not all the data currently on iPhone. Then we need the help of third-party tool. Here we introduce the best tool to do this job. 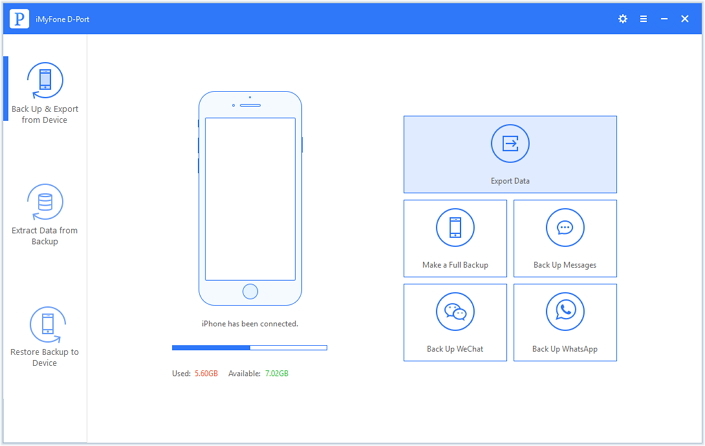 Well, it is iMyFone D-Port iPhone Data Exporter, with which you can selectively export the data you want from the iOS device in a hassle-free way. iMyFone D-Port is the solution that not only saves your time but gives you unlimited access to your data. 20 types of data are supported. With iMyFone D-Port, you can make selective backup of your data that is not possible with iTunes or iCloud. iMyFone D-Port is your data transfer solution where you can export data in a easy way with simple interface. 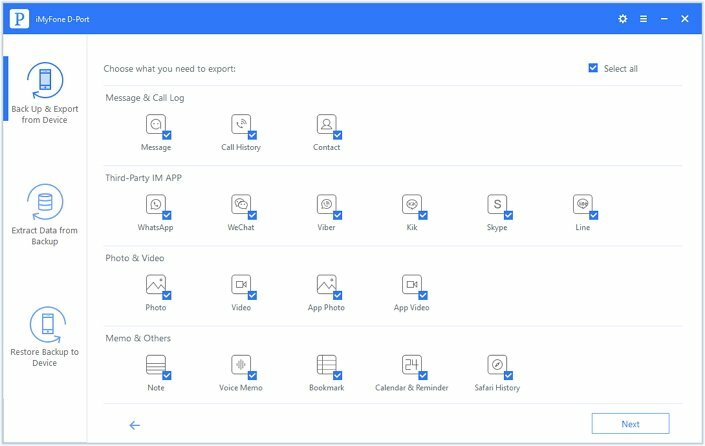 You have access to the data of third-party applications like Whatsapp, WeChat, Line, Kik and so on. No failure in data extraction at all. Step 1. Download iMyFone D-Port and launch it on your computer. From "Export from iOS Device" tab, click on "Start" and proceed. And then select the file types you need to export and click "Next." You will be then asked to connect your iOS device to the computer. Step 2. In this step, you need to scan your iOS Device fully. Once your device is connected, click on "Scan" button and the program will then began to scan your device. Step 3. In this step, you need to preview and export Data from iOS Device. Once the scan is complete, the data available will be displayed on the interface. 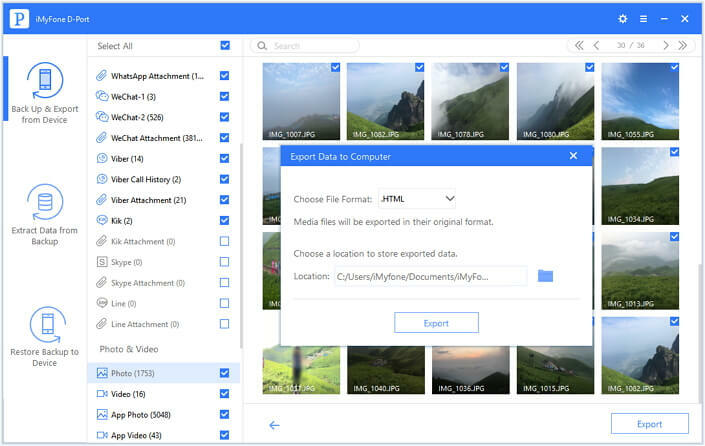 Select the files you need back up, and then just click on the "Export" button. Step 4: Finally, you can decide where you want to save the data. A popup window will appear, and you can select where you want to save it. There are some people who forget to back up their iPhone before battery replacement. And they fall into the trouble due to data deletion on their devices. There are many recovery tools in the market. Here we would like to introduce one of the best recovery tools to you. It is iMyFone D-Back or iMyFone D-Back for Mac. With the help of it, your data is rescued easily and efficiently. 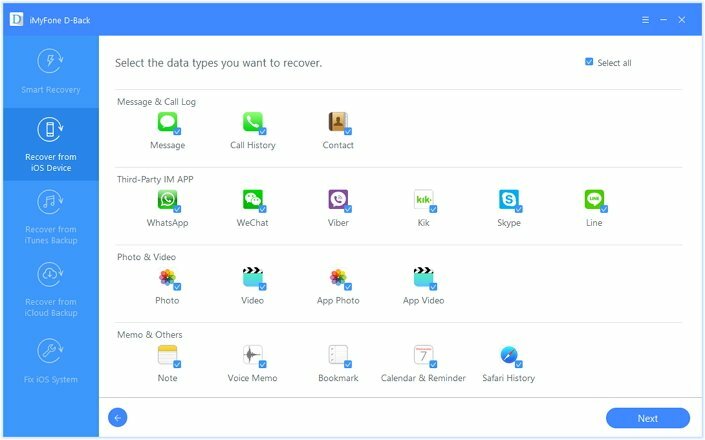 Let's explain how you can recover your lost data by iMyFone D-Back. 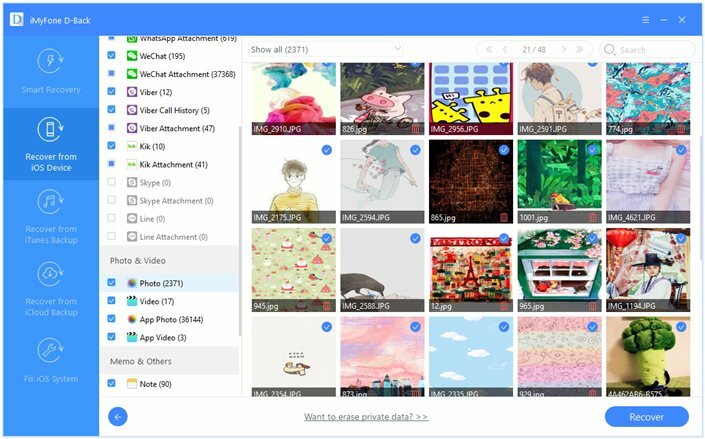 It supports 22+ file formats, and that includes almost every format, for example, note, contacts, photos, messages, WhatsApp, WeChat, Line, and so on. You can make selection of data you want to recover. You can preview the data before you recover the data. 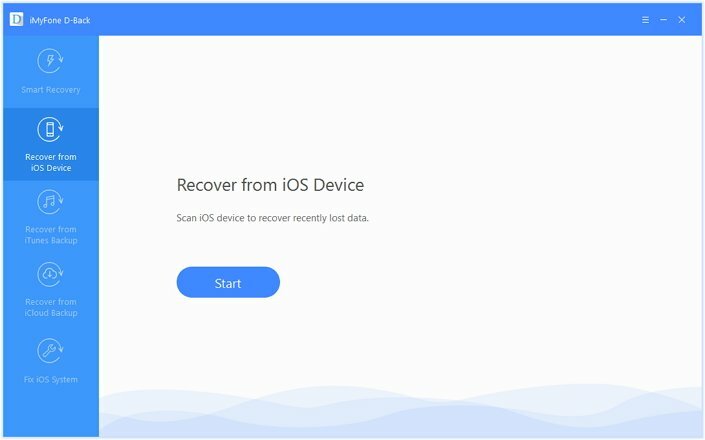 Step 1: Firstly run the program and on the main screen you have four ways to recover data and you need to select "Recover From iOS Device" tab. Now click "Start" to start the recovery process. And then you can select the file types you need to recover. 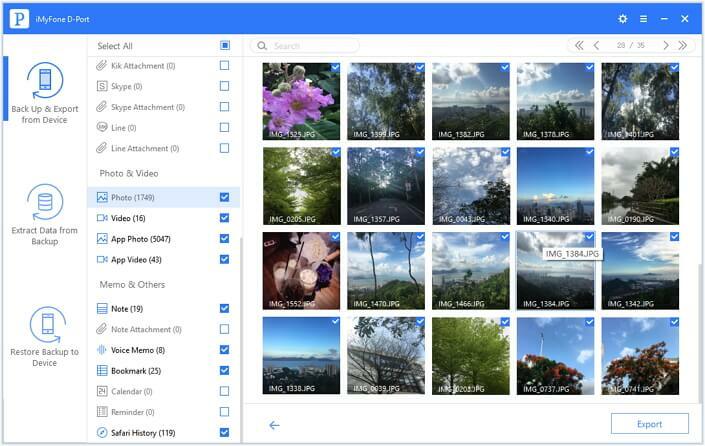 On the screen, iMyFone D-Back will show you file types with formats supported and you can select the file types from the menu. 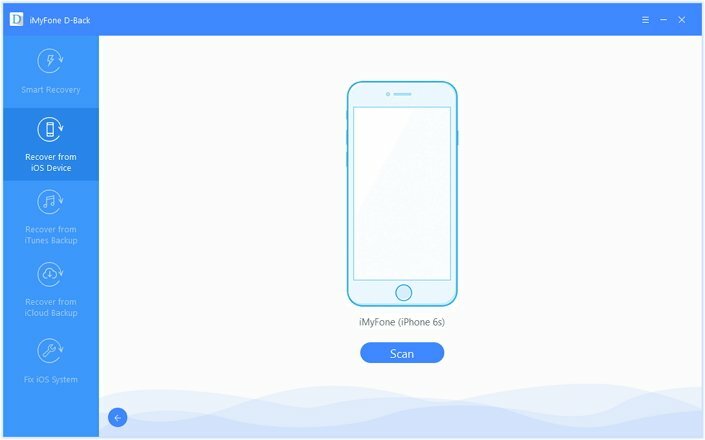 Step 2: After that, you will need to connect your iOS device to your computer and once it is connected successfully, click "Scan" to search your data. Allow sometime for the scanning process. Step 3: Now, you can preview all your data on the screen, and all the scanned files will be displayed. On previewing, you can select the specific data you need to recover. 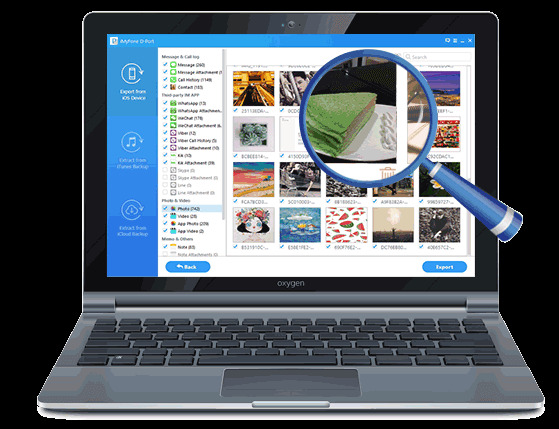 To begin recovery process, click "Recover" and you will then have an option to create a folder where you want to save the recovered data to review. 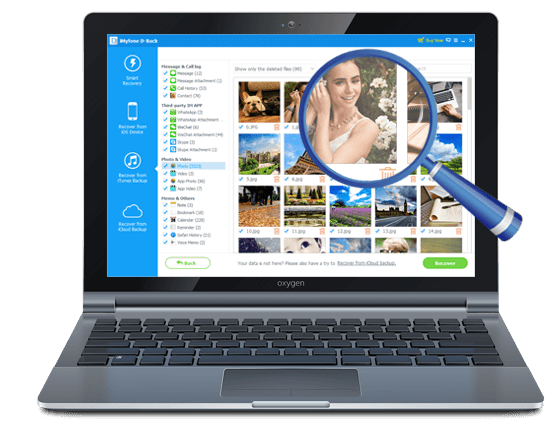 Just download the free trial version of iMyFone D-Back to recover your data after battery replacement. Using iOS 11? Don't worry, iMyFone programs work!